Volleyball Medal w/ Red-White-Blue Ribbon - Volleyball Jewelry, Keychains, Medals, etc. This is a great affordable volleyball medal to use as awards for tournaments, camps, prizes, or year-end banquets. The size of this Volleyball Medal is 1-1/2" diameter, and comes with a 7/8� x 30� long Red, White & Blue Ribbon. 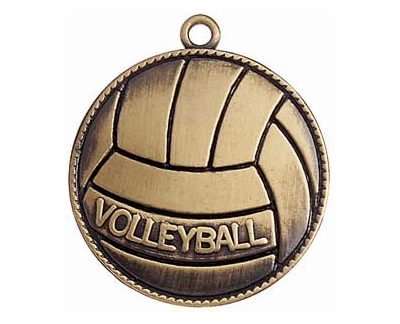 Round Volleyball Medals are available in these colors: Gold, Silver and Bronze. SCROLL DOWN TO ORDER A GIFT BOX FOR THIS ITEM!